Just think, if it were only sixty years ago, you could turn on your radio tonight at 8:oo and hear Edgar and Charlie on CBS. This ad's been laying around the scanner for a long time, never seeming to find a place in previous postings (even though Bergen and McCarthy have been subjects of earlier Greenbriar stories --- go HERE and HERE). Of course, there are plenty of these old radio programs available on CD --- it's amazing how many of the biggest names did guest appearances on the Bergen show. I've read that Edgar expressed himself primarily through the dummies, and that he was actually a rather aloof individual when not in character(s), sort of like Michael Redgrave in Dead Of Night, only funnier. I suppose if you spent an entire career with a dummy in your lap, you might well lose part of yourself in the process --- of course, earning a million dollars with the dummy on your lap would no doubt compensate for a lot of that. 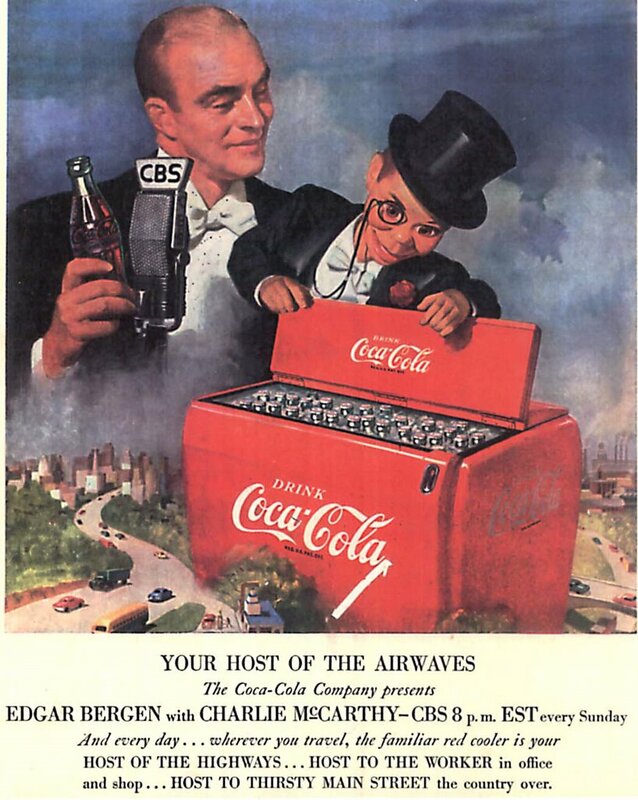 Coke also sponsored the pilot for Edgar's TV series, which apparently was never picked up. It was fairly forced anyway--as are the movies, in my opinion. They have to do tricks like creating the impression of Charlie moving in long shots by placing a mask and a tux on a kid, and it never works for me. For some reason, Mortimer Snerd works better on video for me than Charlie. Anyway, the aborted TV pilot is worth checking out, if only for Jim Backus' appearance.